Shepherd's purse is one of the earliest wild greens to appear in the spring. Before the flower stalks appear, the leaves are especially good in salads or cooked as greens. 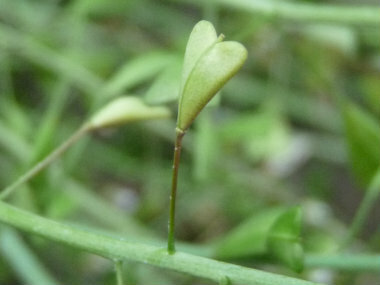 When the plant flowers, the larger basal leaves tend to die off, leaving only the smaller leaves clasping the stem. Although still edible, they tend to get tough, develop more flavour and become labor-intensive to collect. 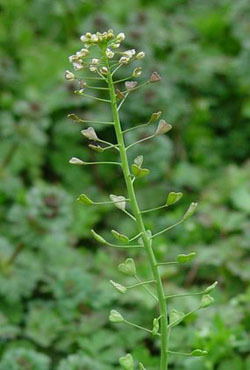 Distinguishing Features: Shepherd’s purse is in the mustard family but it is distinguishable by its valentine or purse-shaped seedpods. In the rosette stage, it can be distinguished from other mustards with the lobed basal leaves as they are usually hairy, the lobes or divisions more or less uniform on each side, and its generally small size. 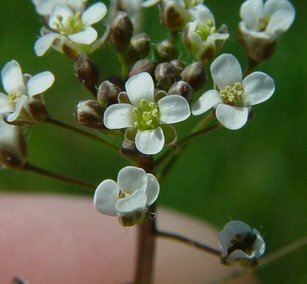 Flowers: Shepherd’s purse flowers resemble wild mustard in form but are white and much smaller (3-8 mm across) in rounded clusters at the ends of stems. Flowers in early spring to late fall. 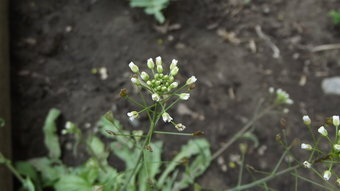 Fields of Nutrition has medicinal benefits and vitamin/mineral content of Shepherds Purse. Leaves: Shepherd’s purse basal leaves grow to 10 cm long. The leaves are stalked, and the first leaves are usually rounded, while the later leaves are usually deeply toothed but may be rather variable. Smaller, slightly toothed, alternate leaves clasp the flower stalk. Height: Although this wild edible can grow to 60 cm tall, it averages more in the 20 to 30 cm range. Habitat: Shepherd's-purse occurs throughout grain fields, waste areas, roadsides, in gardens and lawns. It is also a common weed of cultivated soil. Originally from Europe, shepherd’s purse now grows in many countries worldwide. Edible parts: Shepherds purse leaves can be eaten raw or cooked (raw is healthier). Young leaves used before the plant flowers is a tasty addition to salads. The leaves are a cress and cabbage substitute that becomes peppery with age. The leaves are generally available all year round and can be dried for later use. 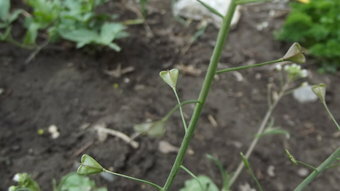 The flowering shoots can be eaten as well. 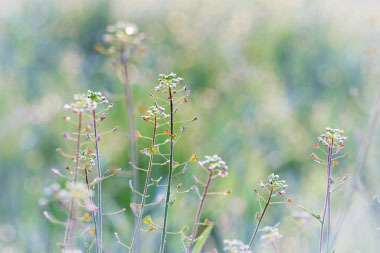 Shepherd’s purse seeds can be used in a salad, but they are so tiny and fiddly you’ll need patience to collect them. The root is also edible; dried and ground up is can be used as a ginger substitute.